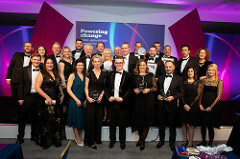 Top performing firms and outstanding individuals from across the country were recognised at the annual awards ceremony, which brought together 270 delegates from across the 71 firms that make up LawNet. Now in its eleventh year, the awards recognise innovation and strategic success achieved by the network’s independent law firm members, as well as highlighting individuals who are delivering outstanding business results. Said LawNet chief executive Chris Marston: “Each year, the entries across our nominated award categories paint a vivid picture of how dynamic firms in the mid-market are squaring up to the future. The sector continues to face many challenges in today’s fast moving political, economic and consumer environment, but we see our member firms actively embracing change and being truly innovative in their strategies. The strategic plan delivered by MBM Commercial LLP saw the firm expand service lines, increase staff by more than 40 percent, open a new office in central London and deliver powerful financial results that included a 70 percent increase in turnover and a 25 percent increase in average income per fee earner. Said Cat MacLean, partner of MBM Commercial LLP: “Exceptional standards and a commitment to quality are the criteria for membership of LawNet, so recognition within this group of excellent law firms makes the award very special. Winner of the Young Lawyer of the Year was Mark Meleady of Devon firm Tozers Solicitors LLP, who was nominated for his outstanding technical ability, winning praise from clients and colleagues alike, and an entrepreneurial mindset, which has included building a new branch office team from scratch. Outstanding Individual Contribution was awarded to sales director Neil Lloyd of FBC Manby Bowdler LLP, who has spearheaded new technologies, management systems and structure. He has helped to reshape the West Midlands-based business, increasing turnover and profit, and embedding innovative people management initiatives. Best Business Development and Marketing went to regional heavyweight Ashtons Legal for their blend of strategic vision and creativity, which has seen the firm building a presence in a range of niche markets nationally alongside their core East Anglian geographic area services. The Excellence in Client Care award went to VWV, for a strategy that makes client care a key deliverable, embedded through an appraised set of objectives and a training requirement for every single member of staff at its offices across Bristol, Birmingham and London. Best Community Contribution went to Gamlins Law Limited. Recognising the part played by its local community in recent growth and commercial success, it launched an ambitious campaign designed to give something back, with staff from across its North Wales offices encouraged to get involved in their community in any way they wished. It has seen initiatives ranging from legal clinics to lifeboat volunteering, an enterprise and support network for women running small businesses, and a commitment to reducing plastic waste, generating over 1,000 hours of volunteering and over £1 million pro-bono advice. This year’s LawNet Enterprise Award, which recognises the firm which has made the biggest contribution in participating in the network over the year, went to Gardner Leader LLP, also celebrating their 25th anniversary as LawNet members.